Introducing Giant Lily 'Table Dance' - a spectacular hybrid of oriental and trumpet lily that certainly has the WOW-factor! The extraordinary candy-pink coloured scented blooms are produced in abundance per stem and as the buds open the eye-catching colour continues to intensify. It has incredible giant flowers reaching up to over 20cm in diameter and is perfect for large patio pots, borders and especially as a cut flower. 'Table Dance' has been proven to be floriferous and vigorous, have improved disease resistance but also a shorter growing time and longer flowering period! Supplied as a pack of 5 bulbs, size 24/26, ready for planting. Introducing Giant Lily 'Table Dance' - a spectacular hybrid of oriental and trumpet lily, that has taken the best bits of both strains to create a sensational, showy new variety that certainly has the WOW-factor! 'Table Dance' has become increasingly popular and it's not hard to see why. The extraordinary candy-pink coloured scented blooms it produces are unlike any other and as the buds open the colour continues to intensify. Looking similar to an oriental, its flowers are actually much larger reaching up to over 20cm in diameter! The best thing is that due to its cross-breeding it produces numerous buds per stem so you'll get an abudance of these beautiful blooms. Flowering continuously from July right through the summer, these giant lilies will create outstanding displays with fewer bulbs. They are proven to be floriferous and vigorous with an improved disease resistance but you'll get all of this with a shorter growing time and longer flowering period! Perfect for large patio containers, 'Table Dance' will easily become a focal point in your garden or on the patio, but is also ideal for cutting too with its tall strong stems, large fragrant flowers and improved vase-life. 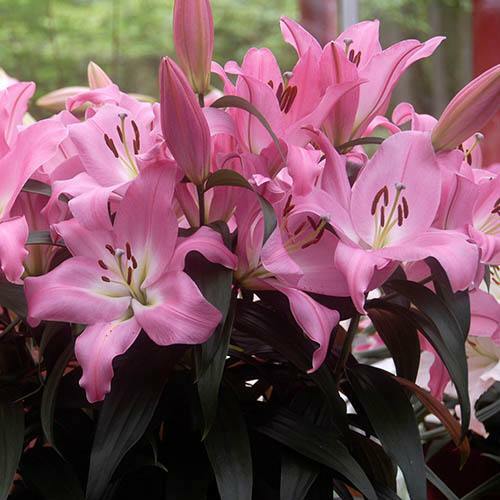 Cut armfuls of your own lilies for the most stunning indoor displays. Supplied as a pack fo 5 lily bulbs size 24/26, ready for planting.